Total power of 15 Watts output for this compact size USB car charger. With Smart-iQ Intelligent Technology, each port intelligently identifies your device to speak its unique charging language. So plug in any brand or model and enjoy compatibility that doesn't limit your charging speed. The future of USB connectivity, offers a whole new level of connectivity. This USB-C cable supports up to 2.1A of power output and can be used for charging and powering USB-C enabled devices. It is perfectly symmetrical top and bottom, meaning that unlike the old USB, the USB-C is reversible and can be plugged in both ways. Plug and unplug easily without checking for the connector orientation. 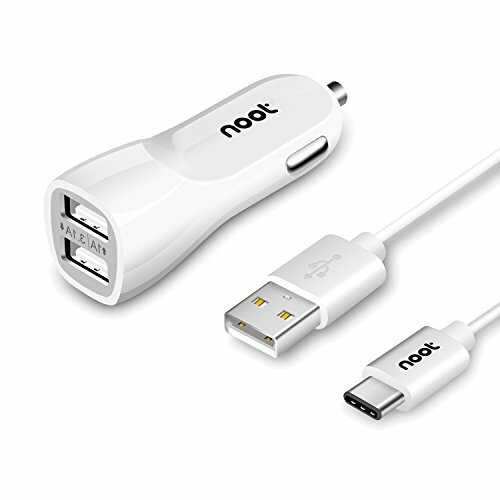 Use any car charger, wall charger, portable charger or multiple ports USB charger to charge your new Macbook, ChromeBook Pixel or other future USB-C devices via this cable. At NOOT PRODUCTS, we believe in our products. That's why we back them all with a 24-month warranty. If you have any questions about this product by noot products, contact us by completing and submitting the form below. If you are looking for a specif part number, please include it with your message.